by Edward Perkins, from Sheila Connolly's Museum Mysteries. I believe I haven’t had the pleasure of making your acquaintance until now, so allow me to introduce myself. My name is Edward Perkins, and I have long been a member of the Pennsylvania Preservation Society. I’ve been invited to join the board of that outstanding institution many times, but I’m reluctant to take on administrative responsibilities at this stage of my life, although I’m pleased that my great-niece Alice has been an intern there for several months now and speaks well of it. Since I was never lucky enough to marry, Alice has become like a grand-daughter to me, and she has excellent judgment. I have deep roots in the Philadelphia area, as does Martha Terwilliger (whom you’ve met before), who I count among my friends, even though she’s a generation younger than I. Nell Pratt, President of the Society, Martha and I have long been concerned about how best to serve the mission of the Society, which has been described as “to preserve and protect” our country’s and our region’s rich history. Sad to say, it is no longer enough to merely preserve the evidence of the past. I’ve seen the city change around me for many years now, and not always for the better. Now that I’m in my so-called sunset years (and still in possession of my faculties) I’ve been casting about for a way to address some of the problems that the city faces, and I think I’ve come up with an interesting solution. Or rather, two intertwined solutions. I must say I’m feeling rather proud of my proposed resolution of some thorny issues. I won’t go into details until the plans have been finalized, but I think many people will be happy with the outcome. I feel that’s my legacy to a city that I love. GIVEAWAY! Leave a comment (with your contact information) and you will be entered to win a copy of Dead End Street (as soon as I lay hands on one!). Edward has also asked that I include another prize: a small model of the well-known Liberty Bell (the original is on display in its own enclosure in front of Independence Hall in Philadelphia. Don’t worry—the model is only 2” high!). 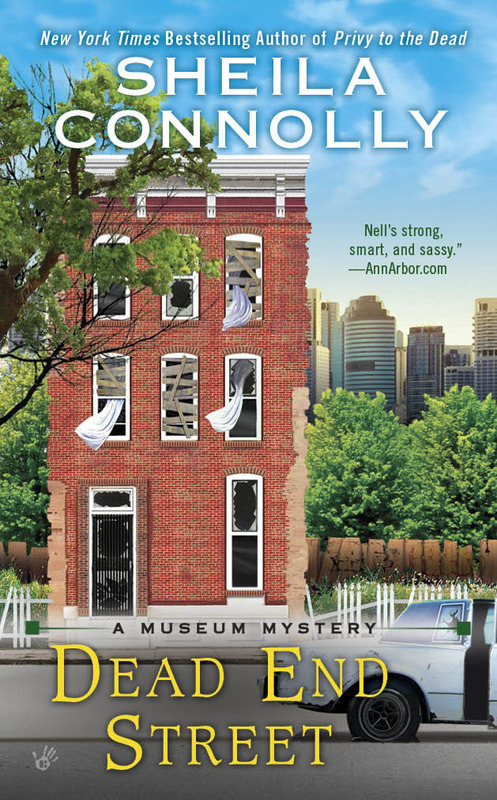 Dead End Street, the seventh Museum Mystery, will be released on June 7th, and you can pre-order it now at Amazon and Barnes and Noble. Well, I want to hear what those two solutions are. I spent one short day in Philadelphia and it was fascinating. Would like to read a series featuring it. Thanks for the giveaway. You'll have to go back! One day is not enough. I feel lucky to have been able to spend a lot of time in the city, getting to know it. I look forward to learning more about the problems and possible solutions. I have always wanted to see the Liberty Bell. Thank you for the giveaway. I remember when I was on a field trip in grade school, we drove by Independence Hall when the Liberty Bell was kind of parked on the green in front of it. The teacher in charge sort of waved vaguely at it, but we didn't stop. Took me decades before I actually saw it up close. I would love to read more. I shall be in Philly this weekend. Just a quick drop off though. Recently started reading this series. Looking forward to reading more. mlarkin at rmrgroup dot com. June 7th seems like a decade away, but I will wait here at 631 South East Street for any tidbits I can get! By the way that address is in Virginia, Illinois 62691. The city has its problems, but a lot of good people are working on fixing things. I like to give credit where it's due. The first time we visited Phillie was when my younger daughter was dating a young man from that area. We drove down in two cars for the day. He showed us all over the Historic District and we visited one or two museums. Then we went down to the river to listen to the concert that was going on that day. For lunch we followed him back to his parents' house and we had BBQ. Ellen and I visited a number of years later and stayed in a mini-suite 2 blocks from The Franlin. This was the summer they did the Star Trek exhibit. I'm still using the mouse pad I bought that day. 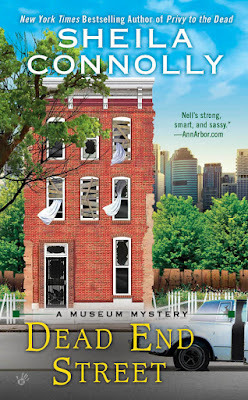 I'd love to be your lucky winner of Sheila's newest Museum Mystery book and add it to my collection. Philadelphia sounds like a place I'd like to visit. I enjoyed seeing Pat and Vanna there on Wheel of Fortune. I'd love a Philly Cheesesteak, too. I'm in Ohio, but Philly would be far away by bus since it's on the east coast. I did go through Pittsburgh on my way to Williamsburg, Virginia. I've never visited Pittsburgh, even though I lived in Pennsylvania for a large part of my life. But it's great that you saw Williamsburg! The only time I was there, it was as a chaperone for my daughter's fifth-grade field trip. Needless to say, I spent more time keeping track of ten-year-olds than admiring the place. I'd love to go back (without children!). 7 June. The day before my birthday. How timely. Interesting---I need to read to understand the solutions. Thanks for the contest. This is a great series. Would enjoy reading about the Pennsylvania Preservation Society. I like visiting museums and can't wait to read "Dead End Street". Thanks for the giveaway. Can't wait to read this. I've never been to Philadelphia. I'm in Ohio but very close to Pittsburgh, PA.
we can't win the REAL Liberty Bell?? Darn! Philly. Would love to read this book. Thanks. I love Sheila's apple orchard series but would love to try this one!! Looking forward to finding out more about your solutions. Great book! I visited Philladelphia when in college seeing the Liberty Bell and many other interesting American History landmarks...fun! Sounds like a great story. Would like to visit Philly one day. I have seen the Liberty Bell! Philadelphia is a neat place to visit and I enjoyed my time there. Looking forward to reading the book this summer. Good luck all! Debbie dalubbert (at) hotmail (dot) com. I hope to visit someday. Thank you for a chance. seascapelife (at ) gmail dot com. Thank you for the giveaway! I have enjoyed your Orchard mysteries, and have the first two County Cork mysteries but I see I need to add your Museum mysteries to the list. Sounds interesting I lived in the city for 40 years and enjoy the history of it. Thank you for introducing me to another "new-to-me" author! Interesting! Would love to win! I live in a suburb of Philadelphia so I understand that fine line between preserving history and making way for progress. I've never been to Pennsylvania but am only a few hours away so I'll make it one day. Soon I hope. Love your blog.